Today I made Red, White and Blue Berry Cheesecake Mousse. It’s almost 4th of July, and I will be prepared. I love watching all of the fireworks when we are in Massachusetts every 4th of July. The only problem is that in the town we stay in every summer, they celebrate Independence Day on the 3rd of July! It’s crazy right? Sparklers are awesome! I love waving them around and making cool shapes with the sparks. I kind of missed my Red, White and Blue Jello, so I decided to make a sweet patriotic dessert again. This recipe came from a cookbook that my mom’s friend Glory wrote > Glorious Layered Desserts. I’m very patriotic and all that… but the naming your kid Glory? That’s like Uncle Sam level of patriotism! Argh I hate my school uniform. Khakis and a black polo? Ew. 🙁 These Red, White and Blue Berry Cheesecake Mousse cups were surprisingly hard to get in the jars. When you spoon the cheesecake in, it gets allllll over the cup! The sides get smeared with the cheesecake and you can’t really even see the beauty of the layered dessert. So you have to spoon CAREFULLY. 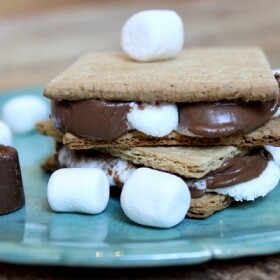 These aren’t perfect, but they tasted darn near perfect! The red white and blue layers seemed surprisingly cool after they were done. A true patriotic dessert in its natural environment! Woooo hoooo! The school year is over!!! I’m going into 8th grade and I’m soooo excited. I can finally be the top dog at school instead of one of the little sevies. It’s terrible for 6th and 7th graders at my school because there is no good name for the 8th graders. 6th graders are Sixlets, 7th graders are Sevies, and 8th graders are… nothing really. Some people call them Double Donuts, but I think that is kind of stupid. Sadly, lacrosse season has come to an end. My team had a great season though. We won 2nd place in the end-of-the-year tournament. I hope I can play this summer when we are on the East Coast, where the big leaguers are at! I’m becoming a better photographer every day. My mom always teaches me the best angles to take photographs, the best backdrops, and even how to garnish food better. 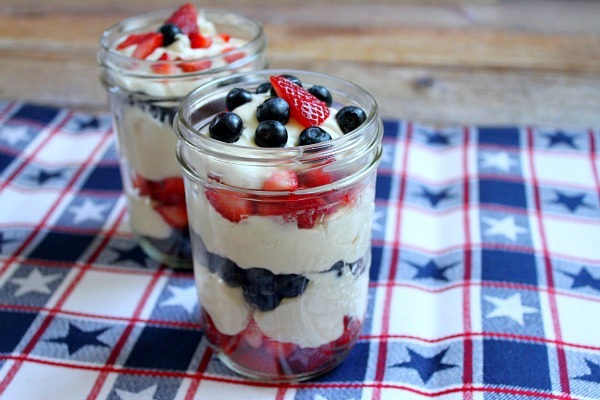 These cheesecake mousse cups are very patriotic, and great for your 4th of July party. With each bite you get a little bit of America! 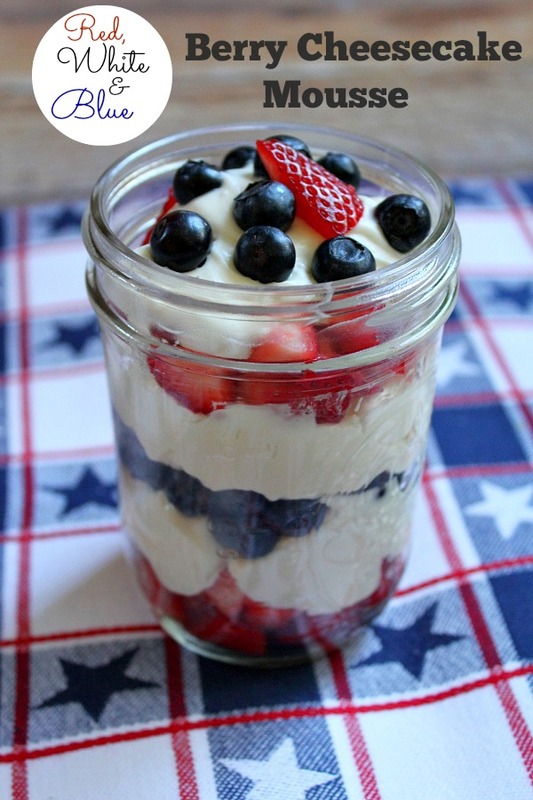 If anyone is looking for a great tasting, no-bake, easy, patriotic dessert, definitely choose the Red, White and Blue Berry Cheesecake Mousse. I hope everyone has a great summer! Where are you guys vacationing? P.S. 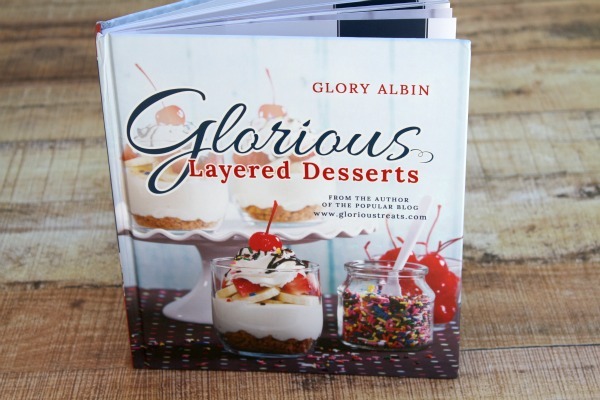 My Mom (RecipeGirl) made a layered dessert from Glory’s book too > Brownie Strawberry Shortcake. Check it out! 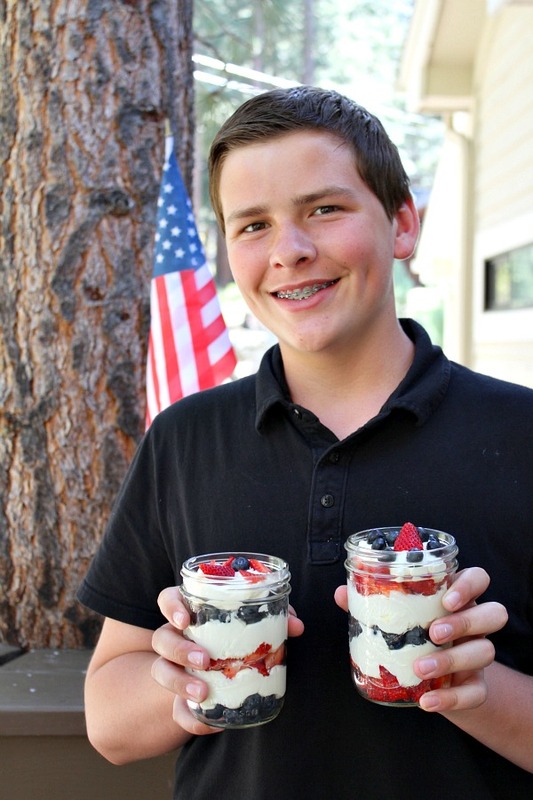 And even a kid can make patriotic foods… Like Me! 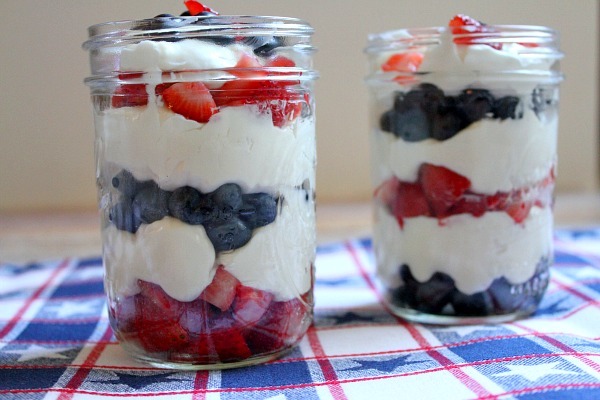 Awesome, no-bake dessert for 4th of July or other patriotic holidays! 1. Prepare the cheesecake mousse: In a medium bowl, use an electric mixer to beat the heavy cream until it begins to thicken. While mixing, slowly add 1/4 cup powdered sugar. Continue to beat until the mixture is thickened and holds a stiff peak. Do not overbeat or it will become overly thick and clumpy. Scoop into a bowl and put in the refrigerator. 2. In the empty bowl (no need to wash), add cream cheese and beat until smooth. Continue mixing and add remaining powdered sugar and vanilla. Add milk and beat until well-combined. Stop mixing and use a rubber spatula to gently fold in the cold whipped cream until combined. Use immediately, or cover and keep refrigerated for up to one day. 3. 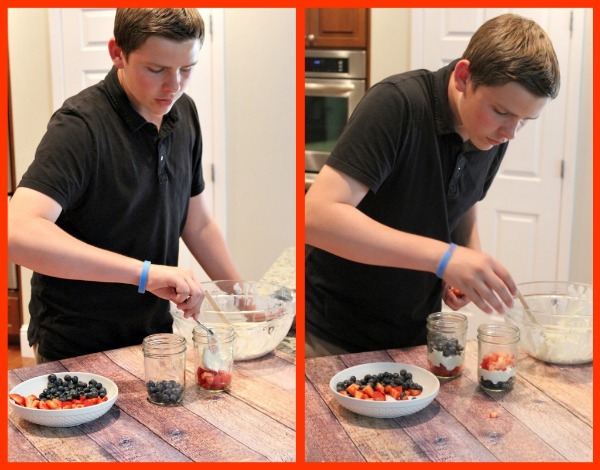 Assemble the cups: Start with fruit in the bottom of each glass or small mason jar. Add a layer of the cheesecake mousse and then repeat with another layer of fruit and another layer of mousse. Continue layering the cheesecake and fruit, depending on the size of your cups and the variety of fruit. Keep refrigerated until ready to serve. TIP: Assembly may be easiest if you fill a large ziploc bag with the mousse, cut off one corner of the bag, and squeeze the mousse into the cups. Hi Brooks, Congratulations on passing to the Eighth grade! I think this a great recipe and the pictures are very clear. This makes sense putting them in a jar instead of carrying around a big container and dishing it all out. This way it is ready to go. Have a great summer and thanks for this blog. You do a fantastic job! 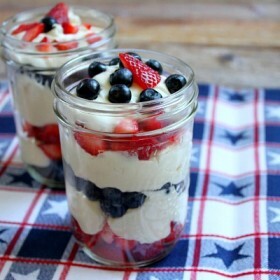 I’m going to make these for the 4th of July. Yours don’t look messy; they look really good. Thank you for sharing. Looks Good! Next time try putting the filling in a ziploc bag, cut off a corner and squeeze it into the jars that way. These look great! 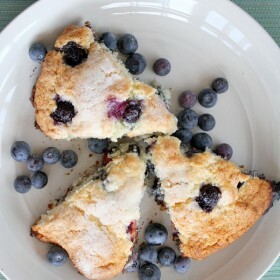 I make something similar with ricotta instead of cream cheese and add a bit of lemon to it. A tip that might help assembly to go quicker next time – put all of the mousse into a large ziploc, twist the top (don’t seal), then snip off the bottom corner and squeeze out your filling into the jars (like a makeshift piping bag). It will help the process to go fast and give you more control over the mousse, such as preventing it from spreading up the sides of the jars. Congrats on passing into 8th grade. It sounds like you are excited for the summer vacation. I laughed about your July 4th comment. I live in MA. Many towns celebrate the evening before the 4th but some still do celebrate on the actual day. I guess for those who love fireworks, it makes for double celebrating. I know you are a Pat’s fan and I wonder if you are in MA in late July. Pre-season training camp starts on July 24th and there are lots of opportunities to go to Gillette to watch open practices. It is a lot of fun to see the players up close and personal…great time to get an autograph or two as well. Just what I needed for our 4th of July block party! I tripled the recipe and put it in two large glass bowls. The kids (neighborhood, not my own!) voted it the best dessert! Of course your cousins don’t like to try anything different – except KATE – she at least tried the mousse from the spatula. Glad to read you are having an awesome vacation in Green Harbor – wish we were there! Glad to hear that Kate tried it. Did she like it?? It’s nice to see a young man, like you, who has a passion for cooking and baking. Your photos are great, and this looks colorful and tasty. If I might make a suggestion, I hope you watermark your photos. People have a tendency to copy and take our work, and not give us credit. Plus, I’d love to see you add a recipe index. Then, you’d really be blogging in full style! Keep up the great work!